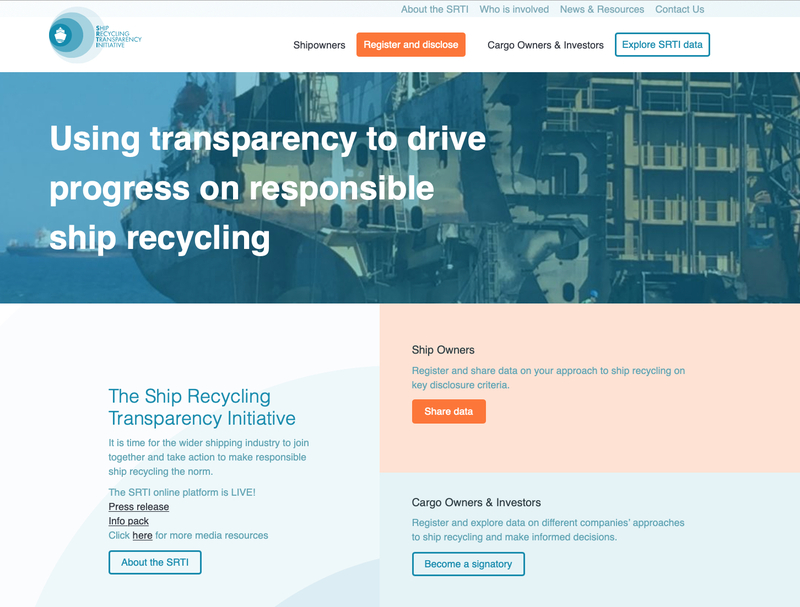 London, 10 December 2018– Industry leaders and non-profit the Sustainable Shipping Initiative today announced the launch of the Ship Recycling Transparency Initiative’s (SRTI) online platform, a tool for sharing information on ship recycling to drive responsible practice. The platform comes nine months after a group of shipping companies first announced their collective effort to use the market-drivers that transparency brings to make responsible ship recycling the norm. Demanding transparency holds the shipping industry to account, raising the bar for current practice as well as creating fair competition among shipowners. In 2017, 835 ships were recycled out of a world fleet of 50,000. Despite the known risks associated with ship recycling there is no global regulation currently in force, resulting in a wide range of approaches – ranging from practices with adverse social and environmental consequences to responsible ship recycling practices, which this initiative is shining the light on. With transparency on shipping companies’ ship recycling policies and practices, it becomes possible for the industry’s stakeholders – including shippers, lenders, investors and insurers – to make informed decisions. The importance of such decisions is increasing with the growing expectation for companies to take responsibility for their value chain sustainability. Responsible ship recycling is good for brand value, protecting reputation and good for business, and is key to being recognised as a responsible and sustainable shipping industry. The SRTI is neither a standard nor a rating tool, it is an online platform that shipping companies can use to disclose relevant information on ship recycling. The information provided is allowed to tell its own story and is readily available to the industry’s stakeholders, as well as the broader public. The platform creates an onus for stakeholders to use the SRTI for both more informed decision-making, as well as to push for greater transparency. The SRTI is hosted by the Sustainable Shipping Initiative and brings together leading shipowners, investors, banks, insurers, cargo owners and other key stakeholders from across the maritime industry. Its founding signatories include shipowners The China Navigation Company, Hapag-Lloyd AG, A.P. Moeller-Maersk, NORDEN, Stolt Tankers and Wallenius Wilhelmsen; financial stakeholders GES, Nykredit and Standard Chartered Bank; classification society Lloyd’s Register; and sustainability non-profit Forum for the Future. The SRTI online platform will be launched at 0900 GMT on 10 December 2018 at www.shiprecyclingtransparency.org. The Sustainable Shipping Initiative (SSI) is a multi-stakeholder initiative that brings together like-minded and leading organisations with shared goals and equal determination in improving the sustainability of the shipping industry in terms of social, environmental and economic impacts. Comprising ambitious leaders spanning the entire shipping value chain, SSI members range from charterers, ship owners and ship yards to ports & port operators, banks, ship finance & insurance providers, classification societies and technology companies. The SSI is leading the way in doing what is right and required to meet the goals outlined in its vision for 2040by way of the SSI Roadmap- in the absence of or going beyond compliance with regulation. We seek to change the narrative of the shipping industry by influencing others to act and ultimately support a level playing field where high performing and sustainability-focussed actors are rewarded by a diverse set of increasingly engaged stakeholders. Find out more at www.ssi2040.organd follow us on LinkedInand Twitter(@SustShipping). For more information, interviews or comment please contact Nicole Rencoret, Head of Communications and Development, Sustainable Shipping Initiative on +45 22 45 38 11 or n.rencoret@ssi2040.org. To find out more about signing up to the Ship Recycling Transparency Initiative contact Andrew Stephens, Executive Director, SSI A.Stephens@ssi2040.org. A series of testimonials/quotes from CEOs and senior leadersof SRTI signatories and stakeholders is available for media use at https://www.shiprecyclingtransparency.org/testimonials/. A series of imagesto accompany articles is also available at https://www.shiprecyclingtransparency.org/news-resources/(please contact n.rencoret@ssi2040.orgto request image files).